We’re looking forward to so many wonderful performances and participation projects this year. Some of which, as you’ll have seen and heard about already on Instagram, has already had a creative and positive impact on our musicians and workshop participants. In our first 2018 podcast (available for download on SoundCloud and iTunes), you’ll hear from Alexandra Wood and our team about what they’re looking forward to this year, including working with people at Bethlem and Maudsley Hospital School (whose music features in our podcast! ), learning more about mental health, Ariadne auf Naxos at OHP, and Star Wars: The Last Jedi coming out on DVD. What are you looking forward to this year, or even this week? Whatever it is, take the time to just enjoy it. Classical and orchestral music has long had a problem with diversity. The cliché is that it’s male, white, middle class, and often dead. And it’s a cliché because it’s often true. City of London Sinfonia want to be part of a movement that changes that. We believe that classical music can transform people across all areas of society and in order to do that we need, and want, to present an Orchestra that better represents that society. There are many issues to tackle here, but on International Women’s Day we want to highlight the issue of gender, and make sure that any young woman who sees the Orchestra – whether in a concert hall or in schools – to look at any role in the Orchestra and think, “I can do that”. Even today, positions of artistic leadership in many orchestras are overwhelmingly held by men, even while the majority of musicians on a concert platform are often female. This is not the message we want to send young women learning musical instruments, that you can be a professional musician, but not a leader. We are very proud that over 60% of our principal seats are already held by female musicians. Our next challenge is to make sure that we champion female conductors and directors, alongside the hugely talented and enlightened male conductors and directors we perform with. That is why, from this Autumn, City of London Sinfonia’s artistic leadership will be 50% female – Creative Director and violinist Alexandra Wood and Principal Conductor Michael Collins. We are also committed to ensuring that at least one female conductor or director perform at every one of our major artistic series. City of London Sinfonia can’t change the orchestral world overnight, but we can make sure that talented young female musicians watching CLS can see a realistic, aspirational vision of what they might themselves become. We’re delighted that our wonderful leader Alexandra Wood appeared on BBC Radio 3 In Tune yesterday with Sean Rafferty, performing ahead of our ÉMIGRÉ concert series. 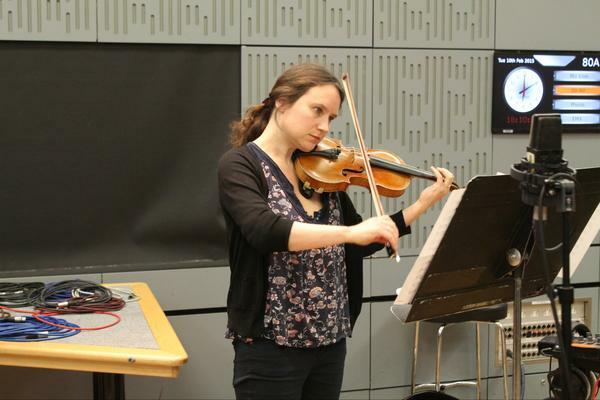 Alexandra Wood on BBC Radio 3 In Tune, 10 February 2015. Taken from @BBCRadio3 Twitter page. She talks about what it means to celebrate émigré artists, London as a cultural hub and life as a musician, before playing Astor Piazzolla’s Tango Etude No.3 for solo violin and Prokofiev’s Sonata for Solo Violin, op. 115, First Movement live in the studio. You can listen to her on catch up from approximately 1 hour 43 minutes in. Month in Pictures – October and November! This Autumn has been a jam-packed season for us at CLS, with our concert series, Shakespeare: Let Music Sound, and lots of education work, including our Lullaby concert tour and Youth Takeover project in association with Orchestras Live in Spalding (we recently worked out that the Orchestra spent an astonishing 86 days in the community this quarter!). In other news this season, we are delighted to have announced Dame Felicity Lott as our new Patron and were thrilled to have her perform two private recitals for CLS Friends at Blain|Southern, preceding her involvement with our outreach projects in Tower Hamlets and Harrow during the next coming weeks. For some of our favourite moments from the time so far, just scroll down! Our Autumn concert series, Shakespeare: Let Music Sound, celebrated Shakespeare’s 450th anniversary through a variety of concerts weaving together play text, live acting and music inspired by the Bard himself. Some of our favourite snaps from the season can be found below, including pre-concert naps, the watchful eye of the Bard himself and the remains of our librarian’s (slightly hectic!) preparations for our performance of Shostakovich’s Hamlet at Village Underground. To find out more about our next concert seasons, Émigré visit our website. A highlight of our Autumn programme was Last Train to Tomorrow, a performance to commemorate the 75th anniversary of the Kindertransport, presented by our friends at the Association of Jewish Refugees at the Roundhouse. A number of the Kinder (the name given to the survivors of the Kindertransport) were in attendance at the concert, as was HRH The Prince of Wales, who has long championed their cause. The audience consisted of the Kinder’s own children, grandchildren, great-grandchildren and other supporters. On 12 November we hosted an exclusive CLS Friends event at Blain|Southern art gallery with CLS leader, Alexandra Wood, Principal Conductor and clarinettist Michael Collins and Dame Felicity Lott. As her first public performance with us as CLS Patron, Felicity was on brilliant form and we hope those of you who joined us enjoyed the evening! Alongside some comedic arias and repertoire by Spohr, the headline piece was Schubert’s Shepherd on the Rock, a piece that Michael and Felicity first performed together 30 years ago! As part of our longstanding partnership with Orchestras Live, our education team were in Spalding last month working alongside Youth Takeover, a group of young producers resident at South Holland Centre to present a concert based on a unique concept. Working with CLS musicians and composer John K Miles, local young musicians and bands curated a concert called ‘Lifetime – redefining the concert experience’. It was fantastic project to be involved in, and the culminatory concert on 26 November was brilliant. A huge well done to all involved! Our education team have been all around the country this term, with our Lullaby concert tour to Suffolk in October, workshops with Freshwater’s Academy, and lunchtime concerts at St Thomas’ hospital, London. As you can see, some of the props went slightly crazy at times, and even made their way into the office! We don’t know about you but we’re still buzzing from last week’s CLoSer at Village Underground. Featuring one of the most profound and important works of the 20th century, Messiaen’s Quartet for the End of Time, the concert showcased not only the poignancy of its original composition (the work was composed during Messiaen’s imprisonment in Stalag VIII Prisoner-of-War camp in Gorlitz) but also Michael Collins and our Principal Players’ extraordinary playing. With birdsong on entry, atmospheric lighting inspired by Messiaen’s synaesthesia and fascinating “talking programme notes” to begin, this was truly a night to remember! As usual, we got our fantastic photographer James Berry to take a few snaps of the concert which we thought we’d share in this post, along with some of our favourite comments from our Twitter page. Our next CLoSer event will be The Entertainments in October with a programme featuring two re-imaginings of Shakespeare’s plays: Korngold’s incidental music for Much Ado About Nothing and Shostakovich’s outrageous re-working of Hamlet. Tickets, including £1 early bird tickets for a limited period only, are on sale now! So we thought it was about time we put our new leader, Alexandra Wood, through her paces with our quick fire round, The Score. Here’s a few of her favourite things..
Really depends on my mood, and what I happen to be playing at that time, but you normally can’t beat a bit of Bartok! Bassoon -though is that cheating as I do play it too?! Wigmore Hall, not only a fabulous acoustic, but always a special atmosphere too.